Q: How does the recipient use these E-Gift Certificates? A: During checkout, after entering shipping and billing address information, the recipient will be prompted for their credit card information. On that screen there is a box at the top of the page prompting them for the e-gift certificate code. Enter it in and their total will be updated. Q: My recipient did not receive an email with the code. What do I do? A: If you only entered the recipient's email address but did not check to send them an email, the system does not register that you would like an email sent. Please contact the Webmaster to send the notification email for you. Q: Can the recipient use more than one e-gift certificate when they place their order? A: Yes, when placing the order for services and products, you can use as many e-gift certificates as are available. Simply enter one code at a time during the checkout process. 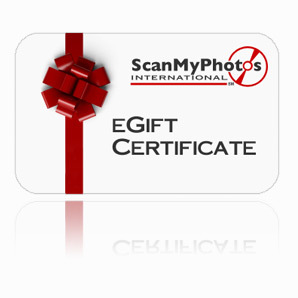 Q: Can the recipient use these e-gift certificates towards your Pay-per-1,000 photo scanning? A: Yes, they will need to put the code on the order form, making sure that it is exactly as it appears in the email. Q: Do these e-gift certificates expire? A: No, these e-gift certificates do not expire.